Rao MPR, Panaduranga P, Al-Mukhaini M, Sulaiman K, Al-Jufaili M. Predictive Value of a 4-Hour Accelerated Diagnostic Protocol in Patients with Suspected Ischemic Chest Pain Presenting to an Emergency Department. Oman Med J 2012 May; 27(3):207-211. Triage and management of patients with suspected ischemic chest pain in the emergency department (ED), who have a low probability acute coronary syndrome (ACS) is challenging. Current guidelines suggest that patients with suspected ischemic chest pain should undergo rapid assessment with repeat ECGs and serial cardiac injury markers.1 There are many emergency triage protocols/algorithms/risk scores (e.g. Thrombolysis in Myocardial Infarction [TIMI] risk score) using a variety of variables to risk-stratify chest pain patients in the ED.2-4 Even though, these risk scores have high sensitivity in diagnosing ACS they do not have adequate specificity to discharge low-risk patients safely and they are not widely applied in the ED. In addition, guidelines recommend chest pain units (CPU) with point-of-care use of exercise treadmill test (ETT) or nuclear scan as well as computed tomography coronary angiography (CTCA) before discharging low-risk patients from ED.1 These modalities are not widely available in ED especially in developing countries including Oman. A 4-hour risk stratification accelerated diagnostic protocol (ADP) using three variables chest pain, ECG and Troponin T is being followed in our ED to identify low probability ACS with early discharge of patients. The aim of this study was to prospectively validate the safety of a predefined 4-hour ADP using chest pain, ECG, and troponin T among patients with suspected ischemic chest pain presenting to ED. One hundred and thirty-two patients aged over 18 years with suspected ischemic chest pain lasting more than 5 minutes and presenting within 12 hours onset along with normal or non-diagnostic ECG and negative first Troponin T were recruited. The study was conducted from September 2008 to February 2009 at Royal Hospital, Muscat, Oman. Troponin T was analyzed using 4th-generation Roche Elecsys Troponin T assay done in the laboratory. A positive troponin T was defined as >99th percentile of the assay used (>0.01 μg/l). Ethical approval was obtained and all patients gave informed consent. The inclusion criteria was based on the following factors: 1). Chest pain or discomfort suspected to be ischemic and lasting more than 5 minutes but within 12 hours duration; 2). ECG: normal or non diagnostic (nonspecific changes or unchanged from previous); and 3). Troponin T negative on arrival. The exclusion criteria was based on the presence of the following factors: 1). Age <18 years; 2). High probability ACS features on arrival- On going chest pain with or without new ischemic ECG changes (ST-segment elevation or depression ≥1 mm or T-wave inversion >2 mm in ≥2 anatomically contiguous leads), positive Troponin T, or hemodynamic compromise, were directly admitted, and excluded from the study; 3). Any other clear cause other than ACS for the symptoms; 4). ACS in past 4 weeks; 5). ECG showing left bundle branch block or pacing rhythm; 6). Chronic kidney disease requiring dialysis; and 7). Anemia requiring transfusion. Step 1: Identify patients with suspected ischemic chest pain + normal or non diagnostic ECG (nonspecific changes or unchanged from previous) + Troponin T negative on arrival. Step 2: Persistent or recurrent chest pain, or new ECG changes or troponin test positive at 4-hours; admit to coronary care unit. N.B. for patients presenting within 2 hours onset of chest pain, the protocol is extended to 6 hours. Step 3: Negative step 2, admit patient to ED based chest pain unit for ETT. If ETT positive, admit coronary care unit or monitored bed. Step 4: If ETT negative; discharge patient with cardiology clinic appointment within 30 days. Figure 1: The New 4-hour Accelerated Diagnostic Protocol. 1). Primary end point - Major adverse cardiac events (MACE) including death, myocardial infarction, and revascularization at 30 days for patients discharged and in-hospital MACE for those admitted; and 2). Secondary end point - Follow-up exercise stress test (ETT or nuclear) results among patients discharged from ED. All patients had an ECG and Troponin T within 10 minutes of arrival and at four hours. For patients who presented less than two hours after the onset of chest pain, ECG/Troponin T was performed six hours after the onset of pain, so that tests were performed in all patients at least six hours after the onset of pain. Data collected included demographic, clinical, ECG, Troponin T, and outcome data including MACE. At 4 hours, low probability ACS patients defined as "no chest pain, negative ECG and Troponin T tests" were discharged home with 30-day clinic appointment. All parameters had to be negative at 4 hours for the ADP to be considered negative (and thus for the patient to be identified as low probability ACS). High probability ACS patients at four hours defined as "presence or absence of chest pain with or without positive ECG or Troponin T test" were admitted and followed for MACE in-hospital. Any of the three parameters if positive was considered high probability ACS. They underwent in-hospital coronary angiography and revascularization as per hospital practice. Data are presented as number (%) and/or mean ± SD. Patients were divided into two groups: Group I Low-probability ACS with negative ADP and Group II High-probability ACS with positive ADP. The Fisher’s exact test and unpaired t-tests were used to compare baseline variables between two groups. P values less than 0.05 (two-tailed) were considered to indicate statistical significance. χ2 analyses were used to generate two-by-two tables for the calculation of sensitivity, specificity, positive/negative predictive values, and likelihood ratios. All analyses were done with SPSS 10. There was no difference in length of ED stay between groups I and II (5.07 ± 0.74 vs. 5.44 ± 0.82 hours). About 30-40% of the patients presenting to ED with chest pain had past CAD with significant number of PCI and CABG patients. Table 1: Baseline characteristics of low probability (ADP negative) and high probability (ADP positive) ACS patients with suspected ischemic chest pain presenting to emergency department. Values are n (%) or mean ± SD unless specified; ADP=Accelerated diagnostic protocol; ACS=Acute coronary syndrome; CAD=Coronary artery disease; MI=Myocardial infarction; PCI=Percutaneous coronary intervention; CABG=Coronary artery bypass graft surgery; ED=Emergency department; NS=Not significant; NA=Not applicable. Table 3 shows MACE in the two groups. Total MACE was 15% (17/110). MACE occurred in 8 (8.4%) and 9 (60%) patients in Groups I and II, respectively. There was one death (1.05%) in the ADP negative group along with 1 ST-elevation MI (1.05%), 3 CABG (3.15%) and 3 PCI (3.15%) procedures within 30-days follow up. The patient who died was a 70 year old male who presented 25 days after discharge from ED in cardiac arrest and expired after unsuccessful resuscitation. In the ADP positive group, there was no death, 3 (20%) patients had non-STEMI and 6 patients underwent revascularization [2 (14%) PCI and 4 (26%) CABG]. Remaining 6 patients had either normal coronary arteries or non significant CAD on coronary angiography. All these six patients had normal ECG and troponin T at 4 hours and were admitted based on chest pain and treated as unstable angina. Only 50 of the 95 patients discharged had an ETT or nuclear scan. 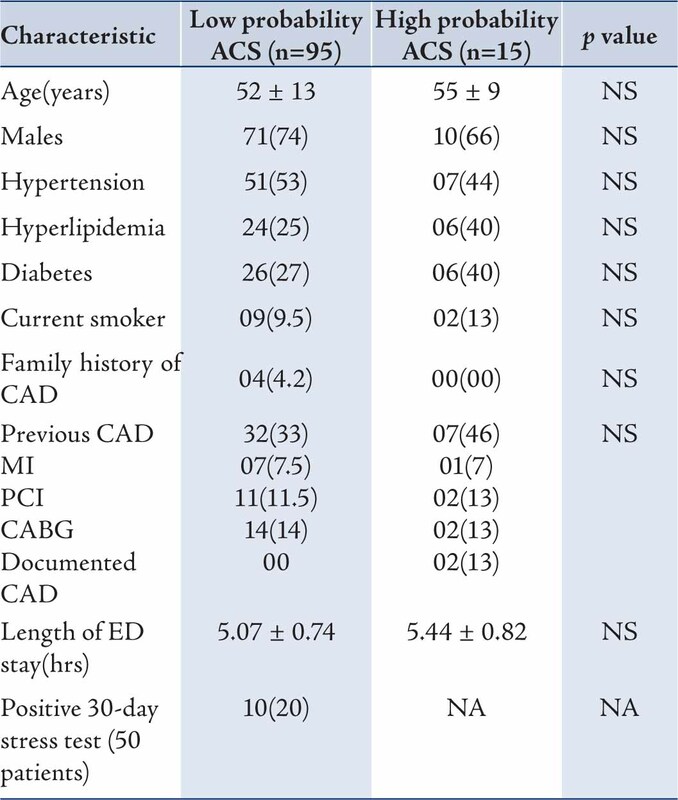 Among these 50 patients 10 (20%) patients tested positive at 30-days indicating underlying CAD. 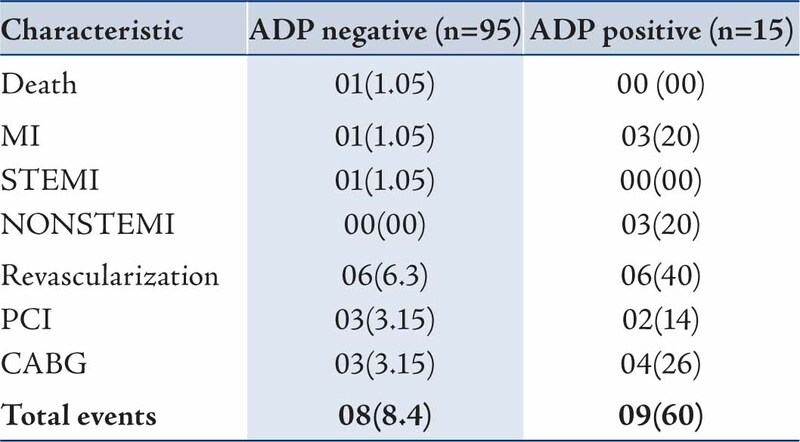 The ADP had a sensitivity of 52% (95% CI: 0.28-0.76), specificity of 93% (0.85-0.97), a negative predictive value (NPV) of 91% (0.83-0.96), a positive predictive value (PPV) of 60% (0.32-0.82), negative likelihood ratio (LR) of 0.5 (0.30-0.83) and a positive LR of 8.2 (3.3-20) in predicting MACE (Table 4). NPV was high at 91% indicating that in a patient with ADP negative result there is 91% chance that he/she does not have short-term MACE; leaving 9% chance that it is false negative. Similarly, if ADP is positive, there is 60% chance that patient has MACE; leaving 40% chance that it is false positive. Table 2: 30-days MACE in patients with negative ADP and in-hospital MACE in patients with positive ADP among suspected ischemic chest pain patients presenting to emergency department. Values are n (%); MACE=Major adverse cardiac events; ADP=Accelerated diagnostic protocol; MI=Myocardial infarction; STEMI=ST-elevation myocardial infarction; PCI=Percutaneous coronary intervention; CABG=Coronary artery bypass graft surgery. 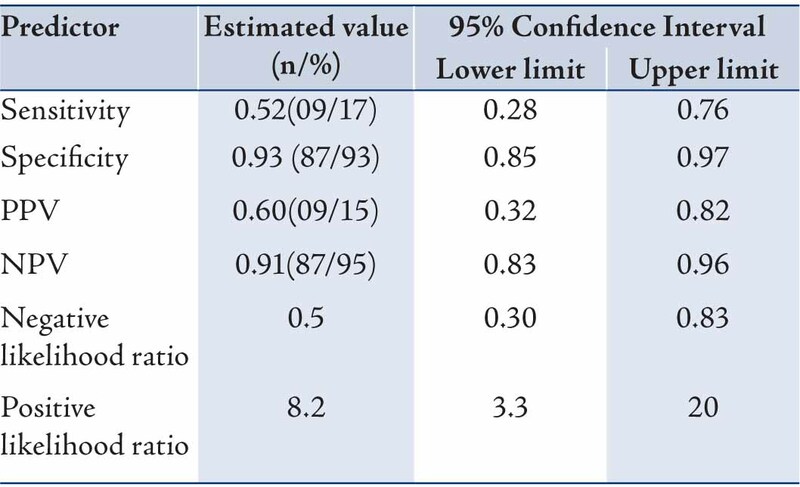 Table 3: Accuracy (95% Confidence Interval) of an accelerated diagnostic protocol for prediction of MACE in patients with suspected ischemic chest pain presenting to an emergency department. Although from this study it can be concluded that majority of the patients who are ADP negative have a good prognosis and can be discharged early from ED; the drawback was the incidence of MACE that was relatively high at 30-days. In addition, this protocol resulted in 40% false positive patients who were admitted. This was predominantly due to chest pain component of the protocol which is subjective.20 In a meta-analysis to identify the elements of the chest pain history that may be most helpful to the clinician in identifying ACS in patients presenting with chest pain, it was noted that although certain chest pain characteristics decrease or increase the likelihood of ACS, with negative and positive likelihood ratios that range from 0.2 to 4.7, respectively; none of them were powerful enough to support discharging patients according to the chest pain history alone.20 Hence, in realty many patients are admitted if chest pain is persisting even though it may not indicate ACS. This protocol reduces the number of patients needing prolonged assessment in the ED as well as prevents overcrowding. However, to reduce number of false negative patients and decrease MACE further, as well as reduce false positive patients and decrease unnecessary admissions, it is prudent to adopt point-of-care ETT in the ED. Another option is to adopt TIMI risk score, but recent studies have shown that the specificity is so low; another confirmatory test is needed in addition to risk score.21,22 Hence adding ED ETT to this present protocol is more appropriate. Immediate ETT in the CPU in the ED for low risk patients is feasible, inexpensive, safe, and accurate for determining those who can be discharged safely from the ED. Further studies are needed to evaluate the accuracy of ETT incorporated ADP in this population. The ESCAPE (effectiveness and safety of chest pain assessment to prevent emergency admissions) trial from UK showed that CPU care was more cost effective along with a low 30-day MACE of 1.7% in those patients discharged from CPU.23,24 Fig. 1 shows the suggested new ADP protocol. The study has few limitations. The present study included a convenience sample of eligible patients presenting at the time when the primary investigator was either working or present in the ED, spread across 24 hrs. The entire population at risk over the time period was not studied. The follow-up was limited to 30 days only. Moreover, not all patients discharged had an ETT. Newer troponin T assays, which typically have lower detection limits and higher analytical precision, would probably improve the sensitivity of this ADP for the prediction of MACE. A 4-hour ADP using chest pain, ECG, and troponin T had high specificity and negative predictive value in predicting 30-day MACE among low probability ACS patients discharged from ED. However, 30-day MACE in ADP negative patients was relatively high in contrast to guideline recommendations. Hence, there is a need to establish ED chest pain unit and adopt new protocols especially adding a point-of-care exercise treadmill test in the ED. 1. Amsterdam EA, Kirk JD, Bluemke DA, Diercks D, Farkouh ME, Garvey JL, et al; American Heart Association Exercise, Cardiac Rehabilitation, and Prevention Committee of the Council on Clinical Cardiology, Council on Cardiovascular Nursing, and Interdisciplinary Council on Quality of Care and Outcomes Research. Testing of low-risk patients presenting to the emergency department with chest pain: a scientific statement from the American Heart Association. Circulation 2010 Oct;122(17):1756-1776. 2. Farkouh ME, Aneja A, Reeder GS, Smars PA, Bansilal S, Lennon RJ, et al. Clinical risk stratification in the emergency department predicts long-term cardiovascular outcomes in a population-based cohort presenting with acute chest pain: primary results of the Olmsted county chest pain study. Medicine (Baltimore) 2009 Sep;88(5):307-313. 3. Pollack CV Jr, Sites FD, Shofer FS, Sease KL, Hollander JE. Application of the TIMI risk score for unstable angina and non-ST elevation acute coronary syndrome to an unselected emergency department chest pain population. Acad Emerg Med 2006 Jan;13(1):13-18. 4. Lyon R, Morris AC, Caesar D, Gray S, Gray A. Chest pain presenting to the Emergency Department–to stratify risk with GRACE or TIMI? Resuscitation 2007 Jul;74(1):90-93. 5. Luepker RV, Apple FS, Christenson RH, Crow RS, Fortmann SP, Goff D, et al; AHA Council on Epidemiology and Prevention; AHA Statistics Committee; World Heart Federation Council on Epidemiology and Prevention; European Society of Cardiology Working Group on Epidemiology and Prevention; Centers for Disease Control and Prevention; National Heart, Lung, and Blood Institute. Case definitions for acute coronary heart disease in epidemiology and clinical research studies: a statement from the AHA Council on Epidemiology and Prevention; AHA Statistics Committee; World Heart Federation Council on Epidemiology and Prevention; the European Society of Cardiology Working Group on Epidemiology and Prevention; Centers for Disease Control and Prevention; and the National Heart, Lung, and Blood Institute. Circulation 2003 Nov;108(20):2543-2549. 6. Wright RS, Anderson JL, Adams CD, Bridges CR, Casey DE Jr, Ettinger SM, et al. 2011 ACCF/AHA Focused Update of the Guidelines for the Management of Patients With Unstable Angina/Non-ST-Elevation Myocardial Infarction (Updating the 2007 Guideline) A Report of the American College of Cardiology Foundation/American Heart Association Task Force on Practice Guidelines. American Academy of Family Physicians, American College of Emergency Physicians, Society for Cardiovascular Angiography and Interventions, and Society of Thoracic Surgeons. J Am Coll Cardiol 2011;57:215-367 . 7. Pope JH, Aufderheide TP, Ruthazer R, Woolard RH, Feldman JA, Beshansky JR, et al. Missed diagnoses of acute cardiac ischemia in the emergency department. N Engl J Med 2000 Apr;342(16):1163-1170. 8. Selker HP, Beshansky JR, Griffith JL, Aufderheide TP, Ballin DS, Bernard SA, et al. Use of the acute cardiac ischemia time-insensitive predictive instrument (ACI-TIPI) to assist with triage of patients with chest pain or other symptoms suggestive of acute cardiac ischemia. A multicenter, controlled clinical trial. Ann Intern Med 1998 Dec;129(11):845-855. 9. Limkakeng A Jr, Gibler WB, Pollack C, Hoekstra JW, Sites F, Shofer FS, et al. Combination of Goldman risk and initial cardiac troponin I for emergency department chest pain patient risk stratification. Acad Emerg Med 2001 Jul;8(7):696-702. 10. Christenson J, Innes G, McKnight D, Boychuk B, Grafstein E, Thompson CR, et al. Safety and efficiency of emergency department assessment of chest discomfort. CMAJ 2004 Jun;170(12):1803-1807. 11. Hess EP, Agarwal D, Chandra S, Murad MH, Erwin PJ, Hollander JE, et al. Diagnostic accuracy of the TIMI risk score in patients with chest pain in the emergency department: a meta-analysis. CMAJ 2010 Jul;182(10):1039-1044. 12. Than M, Cullen L, Reid CM, Lim SH, Aldous S, Ardagh MW, et al. A 2-h diagnostic protocol to assess patients with chest pain symptoms in the Asia-Pacific region (ASPECT): a prospective observational validation study. Lancet 2011 Mar;377(9771):1077-1084. 13. Amsterdam EA, Kirk JD, Diercks DB, Lewis WR, Turnipseed SD. Immediate exercise testing to evaluate low-risk patients presenting to the emergency department with chest pain. J Am Coll Cardiol 2002 Jul;40(2):251-256. 14. Ramakrishna G, Milavetz JJ, Zinsmeister AR, Farkouh ME, Evans RW, Allison TG, et al. Effect of exercise treadmill testing and stress imaging on the triage of patients with chest pain: CHEER substudy. Mayo Clin Proc 2005 Mar;80(3):322-329. 15. Kogan A, Shapira R, Lewis BS, Tamir A, Rennert G. The use of exercise stress testing for the management of low-risk patients with chest pain. Am J Emerg Med 2009 Sep;27(7):889-892. 16. Cheitlin MD, Armstrong WF, Aurigemma GP, Beller GA, Bierman FZ, Davis JL, et al. ACC/AHA/ASE 2003 guideline update for the clinical application of echocardiography–summary article: a report of the American College of Cardiology/American Heart Association Task Force on Practice Guidelines (ACC/AHA/ASE Committee to Update the 1997 Guidelines for the Clinical Application of Echocardiography). J Am Coll Cardiol 2003 Sep;42(5):954-970. 17. Hendel RC, Berman DS, Di Carli MF, Heidenreich PA, Henkin RE, Pellikka PA, et al; American College of Cardiology Foundation Appropriate Use Criteria Task Force; American Society of Nuclear Cardiology; American College of Radiology; American Heart Association; American Society of Echocardiography; Society of Cardiovascular Computed Tomography; Society for Cardiovascular Magnetic Resonance; Society of Nuclear Medicine. ACCF/ASNC/ACR/AHA/ASE/SCCT/SCMR/SNM 2009 appropriate use criteria for cardiac radionuclide imaging: a report of the American College of Cardiology Foundation Appropriate Use Criteria Task Force, the American Society of Nuclear Cardiology, the American College of Radiology, the American Heart Association, the American Society of Echocardiography, the Society of Cardiovascular Computed Tomography, the Society for Cardiovascular Magnetic Resonance, and the Society of Nuclear Medicine. Circulation 2009 Jun;119(22):e561-e587. 18. Hickman M, Swinburn JM, Senior R. Wall thickening assessment with tissue harmonic echocardiography results in improved risk stratification for patients with non-ST-segment elevation acute chest pain. Eur J Echocardiogr 2004 Mar;5(2):142-148. 19. Hoffmann U, Bamberg F, Chae CU, Nichols JH, Rogers IS, Seneviratne SK, et al. Coronary computed tomography angiography for early triage of patients with acute chest pain: the ROMICAT (Rule Out Myocardial Infarction using Computer Assisted Tomography) trial. J Am Coll Cardiol 2009 May;53(18):1642-1650. 20. Swap CJ, Nagurney JT. Value and limitations of chest pain history in the evaluation of patients with suspected acute coronary syndromes. JAMA 2005 Nov;294(20):2623-2629. 21. Hess EP, Perry JJ, Calder LA, Thiruganasambandamoorthy V, Body R, Jaffe A, et al. Prospective validation of a modified thrombolysis in myocardial infarction risk score in emergency department patients with chest pain and possible acute coronary syndrome. Acad Emerg Med 2010 Apr;17(4):368-375. 22. Body R, Carley S, McDowell G, Ferguson J, Mackway-Jones K. Can a modified thrombolysis in myocardial infarction risk score outperform the original for risk stratifying emergency department patients with chest pain? Emerg Med J 2009 Feb;26(2):95-99. 23. Goodacre S, Nicholl J, Dixon S, Cross E, Angelini K, Arnold J, et al. Randomised controlled trial and economic evaluation of a chest pain observation unit compared with routine care. BMJ 2004 Jan;328(7434):254. 24. Arnold J, Goodacre S, Morris F; ESCAPE Research Team. Structure, process and outcomes of chest pain units established in the ESCAPE trial. Emerg Med J 2007 Jul;24(7):462-466.